Aquarius the Water Bearer is a large but faint constellation in the Southern sky. The constellation can be seen in the spring in the Southern Hemisphere and the fall in the Northern Hemisphere. 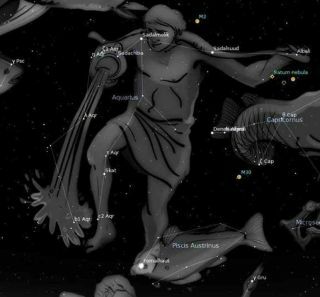 Best viewed: During October at 9 p.m.
Aquarius is located near other water-related constellations: Cetus (the whale), Pisces (the fish), Delphinus (the dolphin) and Eridanus (the river), in what is often referred to as the water or sea section of the sky. Alpha Aquarii, or Sadalmelik, is a giant star located 760 light-years from Earth and has a magnitude of 2.95. Located 158 light-years from Earth, gamma Aquarii, or Sadachbia, has a magnitude 3.8. Zeta Aquarii is at the center of the Y-shaped configuration that forms Aquarius’ water jar. The other stars in the asterism forming the jar are gamma, pi and eta Aquarii. The stream of water consists of more than 20 stars, ending with Fomalhaut. Aquarius includes a number of planetary nebulae, including NGC 7009, one of the brightest in the sky. It also known as the Saturn Nebula because it has a ring that resembles Saturn and was first observed in 1782 by Sir William Herschel, a German-born British astronomer. Aquarius also boasts the closest of all planetary nebulae — NGC 7293, or the Helix Nebula — which is just 400 light-years from Earth. Aquarius also hosts the ultracool star TRAPPIST-1, which is only 40 light-years from Earth (about 10 times the distance from our planet to the nearest star system, Alpha Centauri.) In 2017, astronomers announced that the star hosts at least seven exoplanets, all Earth-sized worlds that are likely also rocky. Many of these planets orbit in the habitable region of the star, which is defined as the zone in which water could exist in the planets' surfaces (depending on parameters such as the planet's atmosphere). Because TRAPPIST-1 is about 8 percent the size of the sun, this means that its habitable zone is much closer to the star; in other words, the planets need to huddle close for liquid water to flow on their surfaces. The seven worlds discovered so far all orbit closer to their parent star than Mercury orbits the sun in our own solar system. Planets were first discovered around this star using Chile's Transiting Planets and Planetesimals Small Telescope (TRAPPIST), in 2010. Follow-up observations have been performed with observatories such as the Very Large Telescope (VLT) in Chile and NASA's Spitzer Space Telescope, but astronomers say a more detailed look may need to wait until NASA's James Webb Space Telescope (scheduled to launch in 2019) can examine the system. Astronomers are using TRAPPIST-1 as a springboard to better understand the proliferation of Earth-sized, rocky planets across the universe, coupled with observations from other telescopes such as Kepler — a prolific planet-hunting telescope that has found thousands of exoplanets since its launch in 2009. In astrology, which is not a science, Aquarius is the 11th sign in the Zodiac and represents those born between Jan. 20 and Feb. 18. Aquarius has also has various meanings and associations in other cultures. Babylonian astronomers identified the constellation as representing the god Ea, or "The Great One," which was often pictured with an overflowing vessel. In ancient Egypt, the water bearer’s jar was said to cause the spring overflow of the Nile when it was dipped into the river. The Chinese astronomers viewed the "stream" as soldiers.